Here you will find a short explanation on how to use youku. Navigating in Youku.com is very easy. This is a small English guide on how to use Youku and navigate around Youku. See image below for translation of the main page and the explanation of that page. The image is self-explanatory. English were added to some key buttons so you can see how it works. You can choose from different categories to see their popular videos. You can also use the search bar to search for videos.When clicking on a image, a pop-up will appear and your video will be loaded. Mind you that a advertisement of 30 seconds will be played. During that time, do not press any ads or a ad popup will show up. When using the search bar, video suggestions will appear. Choose the video you like to see and you are good to go! Use Youku to see Asian videos, not only Chinese but you can find different videos from different countries. Korean Movies are very popular, but also Hindi Or Thai content. Use Youku to find Bollywood or English videos. 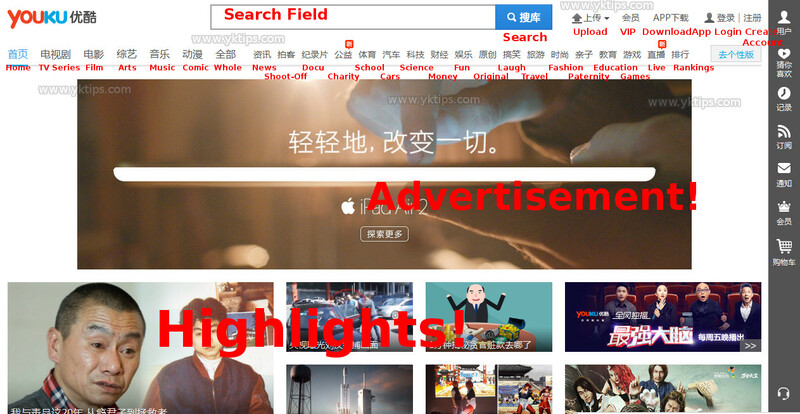 Youku will show you suggested videos based on your preferences in searching videos. If you like to watch horse videos, they will suggest horse videos off course. In History you can see which videos you have seen, if you want to watch again. Messages will show up once you created an account and logged in in Youku. You can check here on how to create a account. VIP’s do have more options but that is not important for now. So it’s very easy. You can decide to create a user name, log in or upload a video.